A wisdom tooth or third molar generally erupts between the ages of 17 and 25. Wisdom teeth commonly affect other teeth as they develop becoming impacted. Wisdom teeth have long been identified as a source of problems and continue to be the most commonly impacted teeth in the human mouth. Wisdom teeth are vestigial third molars that helped human ancestors to grind plant tissue. It is thought that the skulls of human ancestors had larger jaws with more teeth. Shift to a softer (carbohydrate & energy rich) diet overtime has resulted in less forwards growth of the jaw resulting in less space for the wisdom teeth to erupt. This is not an evolutionary change, but rather an environmental change. Tooth Decay: If your wisdom tooth is impacted, saliva, bacteria and food can accumulate around it, causing decay to the wisdom tooth or the tooth beside it. This often leads to a painful infection. Gum Infection: If your tooth is partially erupted through the gum, food particles and bacteria can accumulate beneath the gum, resulting in a local infection. This can lead to pain, swelling and bad breath. You may even find it difficult to chew or open your mouth fully. This infection can spread to the cheek and neck. Pressure Pain: When a wisdom tooth develops, it can cause a lot of pressure against the other teeth in the mouth as they try to make room. This can cause severe pressure pain, and can even lead to erosion of the other teeth. Orthodontic Reasons: If you have received orthodontic treatment to straighten your teeth, your wisdom teeth can compromise the results by moving the teeth out of place. Prosthetic Reasons: When a patient requires dentures, they are advised to have any wisdom tooth removed. If a wisdom tooth grows in beneath a denture, it can lead to irritation, and if removed, the patient will require new dentures as this changes the shape of the gums and mouth. Cyst Formation: A cyst (fluid-filled sac) can form from the tissue surrounding an impacted wisdom tooth. This can lead to bone destruction, jaw enlargement and movement or decay of nearby teeth. The removal of the tooth and cyst is required to avoid further bone loss. Tumors can develop inside these cysts, and they can even result in a fractured jaw if left to grow. Do I Need to Remove an Impacted Wisdom Tooth If it Isn’t Causing Any Problems? When a wisdom tooth is impacted, it is almost certain to cause issues if ignored, especially if it is a lower wisdom tooth. Impacted wisdom teeth are also notorious for causing severe pain. It is best to have an impacted wisdom tooth removed as soon as the problem is detected as to avoid any further issues. If the wisdom teeth are impacted and embedded in the bone, the oral surgeon will put an incision into the gums and remove the tooth or teeth in sections in order to minimise the amount of bone being removed. Some pain and swelling may occur, but it will normally go away after a few days; however, you should call your dentist or oral surgeon if you have prolonged or severe pain, swelling, bleeding or fever. After surgery, swelling and tenderness in the face and neck are common, as is bruising. Ice packs and pain medications prescribed by the dentist or oral surgeon will help, but if you have any questions or are concerned about what you are experiencing, contact your practitioner. From general oral hygiene to eliminating painful and unpleasant symptoms, there are many benefits to getting your wisdom teeth extracted. You may find it difficult to reach your wisdom teeth with your toothbrush or floss. This leads to a build-up of bacteria, sugars and acids that can result in a cavity. If not restored with a filling, the cavity may spread and damage more of the tooth and surrounding structures. Being so hard to access with your daily oral hygiene regime, this accumulation of bacteria and food debris can cause bad breath. 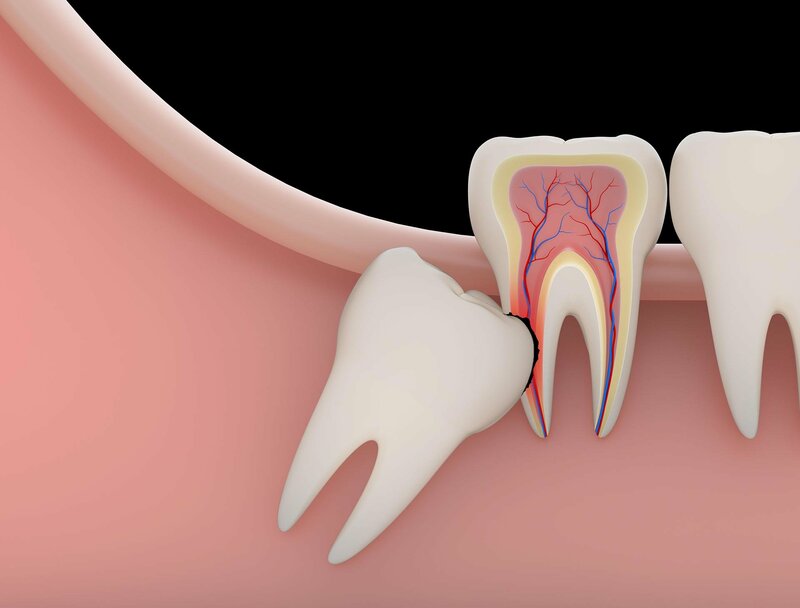 If your wisdom tooth is still under the gums, growing in horizontally rather than vertically, this can put a lot of pressure on the surrounding teeth, leading to crowded and crooked teeth. This can also occur when there is not enough space in the jawbone or mouth to accommodate the wisdom tooth. You may require braces to repair the damage. While still under the gums, your wisdom tooth can become irritated. The gum tissue sitting over the tooth can accumulate bacteria and food debris and become infected. There is a possibility that further issues will occur the longer you wait and the older you get. This is because as you age, the jawbone surrounding the tooth becomes progressively dense making the tooth more problematic to extract. It may also take longer to heal. As with every medical procedure, wisdom tooth removal may also have disadvantages. Depending on the size, shape and position of your wisdom tooth, removal can range from being a simple extraction to a more complex process. In the case of a simple extraction, you can generally expect little swelling, bruising and bleeding. More complex extractions will often result in more severe bruising, swelling and bleeding. These side effects can be minimised and managed with help from your dentist. After your wisdom tooth removal, there is a risk of developing dry socket. This is where the blood clot in the extraction site is dislodged, exposing the bone underneath. This condition causes severe pain but can be resolved in a few days. You can avoid dry socket by following the post-surgery instructions from your dentist.